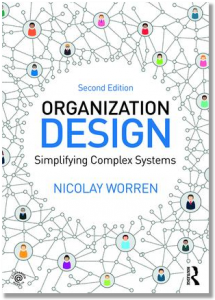 How should we design more effective organizations? A lot of people have tried to answer that question. When writing my own book, I read piles of articles and dozens of books. I interviewed managers in firms to hear about their experiences. I attended conferences in Europe and the US to learn about the latest trends. One thing I found was that it’s hard to get a good overview. So much has been said and written about the topic. It’s difficult to know what to focus on. And to be frank, there are lots of ideas and concepts that are not that useful. I often compare this to a flea market – you have to sift through a lot of old stuff with no value, but if you take the time, you may actually find something really valuable. If I were to pick just five key ideas, out of the many that I encountered, which would they be? I spent some time considering it, and decided on the five. So in a series of brief videos, I will try to explain each of the five ideas. What I have done is to select innovative ideas (or concepts/tools) that I think relatively few people are aware of, and that few organizations have implemented so far. At the same time – ideas that I believe would have a big positive impact, if adopted and implemented more widely. These are ideas that may change the world. At least the world of organizations. They are, importantly, also ideas that have been tested. There’s a theory behind each idea, but that doesn’t mean that the idea is “theoretical”. These are ideas that you can start implementing, or convince your boss to start implementing, today. Since I only spend a few minutes describing each idea, I admit that my description is a bit tabloid. I have to simplify and present the gist of the concept here. I will mention the source for those of you who want to dvelve deeper and find out more about the thinking behind each idea. And of course, it’s totally subjective. I have not done a poll to ask whether these are the ideas people would vote for. If you disagree with those that I have selected, well, feel free to leave a comment below, and we’ll discuss! You find the first video here. In it I discuss the concept of “idealized design” proposed by Russell Ackoff. This is an alternative to defining a vision for the future. Ackoff argued that nobody can predict the future. Instead, it is better to try to imagine what the ideal organization would look like right now. The next video follows in about a week. P.S. If you don’t subscribe to the blog already, make sure you enter your first name and email address below so that you receive the next four videos!